I like granola bars because they are a tasty and quick snack. What I don't like is that they are loaded with preservatives, and some things I can't even pronounce. 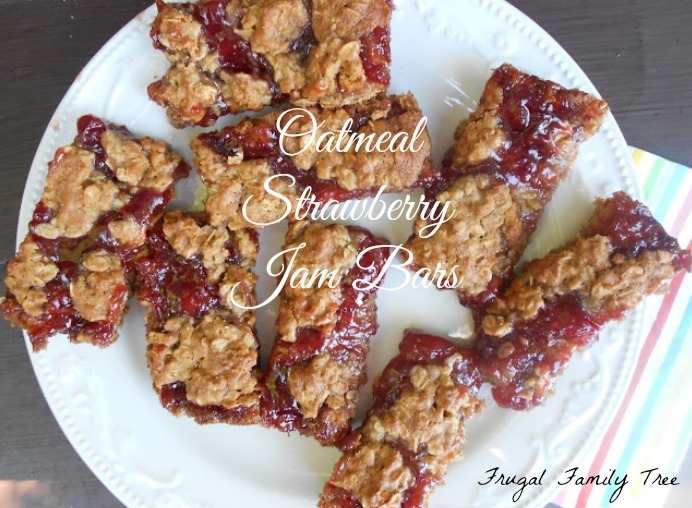 These Oatmeal Strawberry Jam Bars are a great alternative. They are delicious, easy to make, and healthy. You can also change up the jam flavor, raspberry also tastes wonderful. I love them, my family loves them, and I hope you will too. Preheat oven to 350 degrees. Lightly grease an 8x8- inch pan. In a large mixing bowl, cream together butter and brown sugar. Add the egg and honey, mixing until blended. Stir in the oats, the flours, the baking soda, and salt. Batter will be slightly sticky. Using floured hands, press 3/4 of the batter into the bottom of the prepared pan. Spread the jam evenly over the top. Crumble the remaining 1/4 of the batter on top. Bake for 25 minutes, or until lightly browned. Allow to cool in the pan before slicing and serving. I originally published this recipe on my Popcorn and Pearls blog, but wanted to share them here with everyone as well.